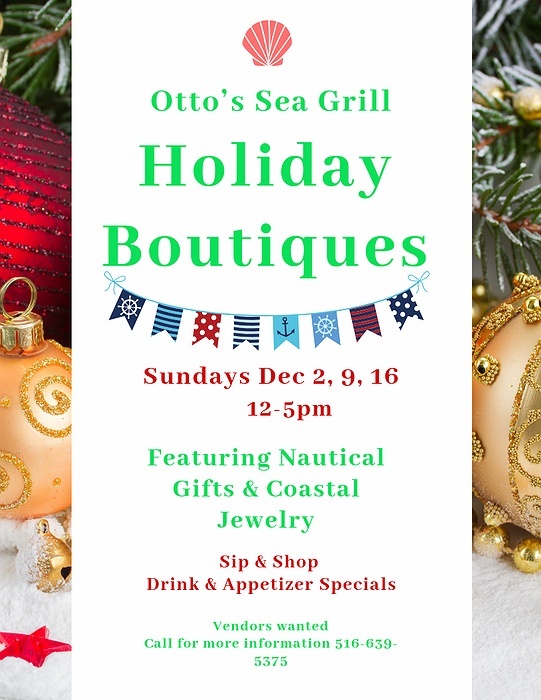 Subject: LongIsland.com - Your Name sent you Event details of "Holiday Boutique"
Nautical / Coastal themed Holiday Boutiques held at Otto’s Sea Grill on The Nautical Mile in Freeport. Avoid the crowds at the malls, relax, unwind, Sip & Shop on the water with Drink & appetizer specials. Live music, Hot chocolate & Hot Cider available. Lunch with the Grinch held on December 16th, same time, bring the kids!